Nioxin and Rogaine are two of the most popular hair loss products around, and you’ll like find people that are on both sides of the argument. It’s not easy to know the difference between the two, so here we’ll have a look through what the best one will be for you. 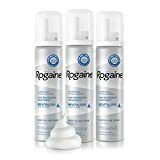 The main difference that you’ll want to consider between these two products is that Rogaine is great for those experiencing male pattern baldness, whilst Nioxin is better for those experiencing thinner hair. It’s a common misconception about Nioxin that it works well for male pattern baldness, but if you head over to their website then they make no such claim! Nioxin is aimed at those experiencing temporary and thin hair; not permanent hair loss. Rogaine, or Minoxidil as it’s known scientifically, is designed to help prevent male pattern baldness. This means that it’s a great option if you’re a guy, but it isn’t targeted at those experiencing temporary hair loss at all. This is the main difference between the two, but there are several other differences and we’ll have a closer look at what the real differences are between the two. Like I mentioned, Nioxin is used for those experiencing hair thinness. You shouldn’t just opt to use it if you’re experiencing hair loss; you could consult your salon or barbers beforehand to see what type of Nioxin you see. Type of Nioxin, I hear you ask? Well, yes actually. There are various different types of Nioxin, which vary dependant on what you hair is currently like. For example, Nioxin 1 is ideal for those with thin and wispy hair, whereas Nioxin 6 is better for thick and coarse hair. If you want to know a little more about the scale of each Nioxin, then have a look here. If you have fine hair, then Nioxin may be the option for you. It’s a pretty simple option for a hair loss solution that you can try without the adverse side effects that are sometimes associated with other hair loss products. I think it’s important to note that Nioxin are a relatively old brand, with over 30 years of experience in the market. This could indicate that this brand really helps to improve the thickness of your hair. I mean, if they were a shoddy brand, would they really have lasted this amount of time and been bought by major corporation Proctor and Gamble over 10 years ago? I very much doubt it. Whilst I commend Nioxin for being in the hair loss industry for a super long time, you also have to consider the same things about Rogaine. It’s over 20 years old, and has really stood the test of time, which speaks volumes about the product itself. Another thing to consider is that the Rogaine name is essentially the same as Minoxidil, although Minoxidil is the chemical term for it, many people just refer to it as Rogaine nowadays anyway. Anywho, Rogaine is a more permanent solution for hair loss that you’ll want to consider if your shedding hair is the result of genetics. The good thing about both of these products is that the side effects are pretty minimal. This is especially true if you consider them with a hair loss product like Finasteride (have a look at why I’d never use Finasteride here!). Inflammation – Some people experience redness of the scalp when they try Minoxidil for the first time, or inflammation. If you do experience this, then you should stop using it immediately. Headaches – One of the less common side effects of Minoxidil is headaches, which is reported by a very small amount of users. This is likely because of the increase in blood flow that your body isn’t necessarily use to. Weight Gain – Again, it’s hard to be sure on which of these side effects are actually caused by Minoxidil and which are just a circumstance of living or caused elsewhere. Personally, I wouldn’t imagine that Minoxidil has the ability to make you gain weight, but that’s my personal opinion. Flakes/Dandruff – A flaky head and dandruff are the most commonly reported side effects of using Nioxin, which are relatively mild when you compare them to some of the side effects of other products. Itchy Scalp – It seems that some people just tend to react to Nioxin negatively, leaving them with an itchy red scalp after prolonged use. Remaining Hair becomes dry – When you’re using Nioxin, it’s best used on those who have minimal hair loss as you’re not going to be growing any hair back. Some users report the issue of their remaining hair becoming dry, which is probably because the Nioxin eliminates a lot of oils from your scalp. It’s really hard to compare these two, as they’re not really made for the same purpose. For this reason, I can’t really say one is better than the other. I mean with the Nioxin, you’re only really using it as a shampoo, so you’re unlikely to notice any difference (unless you’re a scruff that never uses shampoo!). I will say however, that using Rogaine is not ideal by any means. Apply something to your head every day for the rest of our life? No thanks, I’d rather polish my head in the bowling ball machine than do that. To conclude, comparison Rogaine with Nioxin is kind of like comparing apples and oranges – you use them both for different things. If you have thinning hair, you’ll want to opt for Nioxin. If you’re experiencing male pattern baldness, then you’ll definitely want to look at Rogaine or another alternative. If you’re going to go for Rogaine, then you should definitely go for the real product and not for something like a minoxidil shampoo, which has no real proof that it works.